A description of the church of Christ and of Satan, under the figures of a woman and of a great red dragon. 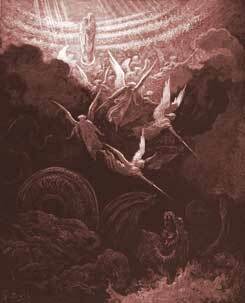 (1-6) Michael and his angels fight against the devil and his angels, who are defeated. (7-12) The dragon persecutes the church. (13,14) His vain endeavours to destroy her, He renews his war against her seed. (14-17)1-6 The church, under the emblem of a woman, the mother of believers, was seen by the apostle in vision, in heaven. She was clothed with the sun, justified, sanctified, and shining by union with Christ, the Sun of Righteousness. The moon was under her feet; she was superior to the reflected and feebler light of the revelation made by Moses. Having on her head a crown of twelve stars; the doctrine of the gospel, preached by the twelve apostles, is a crown of glory to all true believers. As in pain to bring forth a holy family; desirous that the conviction of sinners might end in their conversion. A dragon is a known emblem of Satan, and his chief agents, or those who govern for him on earth, at that time the pagan empire of Rome, the city built upon seven hills. As having ten horns, divided into ten kingdoms. Having seven crowns, representing seven forms of government. As drawing with his tail a third part of the stars in heaven, and casting them down to the earth; persecuting and seducing the ministers and teachers. As watchful to crush the Christian religion; but in spite of the opposition of enemies, the church brought forth a manly issue of true and faithful professors, in whom Christ was truly formed anew; even the mystery of Christ, that Son of God who should rule the nations, and in whose right his members partake the same glory. This blessed offspring was protected of God. 7-11 The attempts of the dragon proved unsuccessful against the church, and fatal to his own interests. The seat of this war was in heaven; in the church of Christ, the kingdom of heaven on earth. The parties were Christ, the great Angel of the covenant, and his faithful followers; and Satan and his instruments. The strength of the church is in having the Lord Jesus for the Captain of their salvation. Pagan idolatry, which was the worship of devils, was cast out of the empire by the spreading of Christianity. The salvation and strength of the church, are only to be ascribed to the King and Head of the church. The conquered enemy hates the presence of God, yet he is willing to appear there, to accuse the people of God. Let us take heed that we give him no cause to accuse us; and that, when we have sinned, we go before the Lord, condemn ourselves, and commit our cause to Christ as our Advocate. The servants of God overcame Satan by the blood of the Lamb, as the cause. By the word of their testimony: the powerful preaching of the gospel is mighty, through God, to pull down strong holds. By their courage and patience in sufferings: they loved not their lives so well but they could lay them down in Christ's cause. These were the warriors and the weapons by which Christianity overthrew the power of pagan idolatry; and if Christians had continued to fight with these weapons, and such as these, their victories would have been more numerous and glorious, and the effects more lasting. The redeemed overcame by a simple reliance on the blood of Christ, as the only ground of their hopes. In this we must be like them. We must not blend any thing else with this. 12-17 The church and all her friends might well be called to praise God for deliverance from pagan persecution, though other troubles awaited her. The wilderness is a desolate place, and full of serpents and scorpions, uncomfortable and destitute of provisions; yet a place of safety, as well as where one might be alone. But being thus retired could not protect the woman. The flood of water is explained by many to mean the invasions of barbarians, by which the western empire was overwhelmed; for the heathen encouraged their attacks, in the hope of destroying Christianity. But ungodly men, for their worldly interests, protected the church amidst these tumults, and the overthrow of the empire did not help the cause of idolatry. Or, this may be meant of a flood of error, by which the church of God was in danger of being overwhelmed and carried away. The devil, defeated in his designs upon the church, turns his rage against persons and places. Being faithful to God and Christ, in doctrine, worship, and practice, exposes to the rage of Satan; and will do so till the last enemy shall be destroyed. The woman in white represents the church. Why use the name of The Lord that he revealed to Moses in the bush unless you are The Lord Jesus Christ himself. Why dident every eye here see you return on a cloud. Why ask questions trying to confuse born again servants of Christ. Oh and why not try encouraging your brothers and sisters if your a believer of The Holy Bible. Blessed be the name of The Lord Jesus Christ for ever and ever Amen. Why say Christ is in you when ye confess not that Jesus Christ himself, even the Christ child, is risen again and walks upon the earth? Yea, how can ye be of the body of Christ if the body has no head? Is not Christ himself, to whom God gives not the Spirit by measure, the head of his own body? If not, then why say God has given you his Son's Spirit? Verily, ye are deceivers, even antichrists. The dragon is Saturn (Isaiah 14:12-15), with the third of the stars as the fallen angels. The woman represents Israel of which Mary was (an Israelite). The child with iron rod (Mathew 10:34 I came not to send peace, but a sword) is Jesus Christ, who ascended to the Father God Almighty. Then Israel will hide during persecution of which Saturn will go against all Christians (remnant) on earth. @Mr. Johnnie. You're speaking Jehovah's Witnesses false beliefs. The woman is Israel, but the man child is Jesus Christ, because vs 5 says he will rule all nations and he has a throne. The Great Red Dragon is Greco-Roman [Iron Clay Toes] religion and Philosophy. The Woman is Mary mother of the Messiah who is Kinsman Redeemer of his own people. The Remnant Seed of the woman [Mary] are the Peoples related by Blood to the Messiah who will return and be Blood Advengerer for the innocence of his People murdered daily. What Do You Think of Revelation 12? The Apostle John sees a vision of a woman clothed with the sun, the moon under her feet and a crown of 12 stars on her head. Who does this most likely represent?